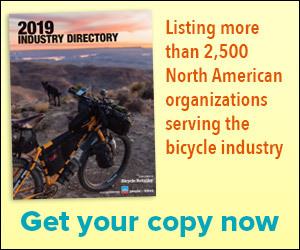 E-bikes are hot topic; dates for TBW in 2018 up in the air. TAICHUNG, Taiwan (BRAIN) — Taichung Bike Week drew some 470 exhibiting companies at five hotels in the city this week. Although the timing is late for U.S. product managers, Taiwanese vendors see it as their last chance to attract OE spec for the upcoming model year. TAICHUNG, Taiwan (BRAIN) — Just a week after Eurobike announced plans to move its show from late August to early July in 2018 the organizers of Taipei's Cycle Show announced an even larger calendar shift: from its current dates in March to late October. TAIPEI, Taiwan (BRAIN) — The organizers behind the Taipei Cycle Show are quietly surveying exhibitors about whether to move the show — traditionally held in March — to either October or November next year. TAICHUNG, Taiwan (BRAIN) — The organizers of Eurobike are working closely with Taichung Bike Week, a OEM event held each fall here. TAICHUNG, Taiwan (BRAIN) — Anyone who has had to cut a tire off a rim with a knife, take heart: Bike tire makers have finally had enough too. Taichung report: What will 2017 bikes look like? TAICHUNG, Taiwan (BRAIN) — Activity is brisk this week at Taichung Bike Week, where OE product managers pack in appointment after appointment, running between three hotels to finalize parts spec for 2017 model-year bikes and engaging in early talks about 2018. TAICHUNG, Taiwan (BRAIN) — Innotorq's torque-sensing rear hub relies on reading the torsional rotation of the cassette barrel around an axle to quantify drivetrain loading. TAICHUNG, Taiwan (BRAIN) — You can configure the car of your dreams online, changing interior and exterior color, engine spec and other options and see how your wishes affect the bottom line. TAICHUNG, Taiwan (BRAIN) — If you drive a hybrid car and have tried non-hybrid tires, you have probably seen your efficiency drop. Hybrid-specific tires are designed to get the most range out of a battery charge. TAICHUNG, Taiwan (BRAIN) — Servicing hydraulic brakes is a pain in numerous ways. Not only does each manufacturer have a slightly different bleed kit, but hose ends are specific to different brands. To service the brakes on the American market takes a variety of bleed kits that invariably get mixed up. TAICHUNG, Taiwan (BRAIN) — Some product managers, distributors and suppliers began arriving here last week to have meetings even prior to the official start of Taichung Bike Week on Tuesday. Still, a good majority streamed into the host hotels — the Tempus, Evergreen and Splendor — throughout the day Monday. TAICHUNG, Taiwan (BRAIN) — Organizers at Taichung Bike Week are moving the dates for next year's meetings into October, approximately two weeks earlier than this year's event held during the first week of November. The new dates, Oct 20-23, 2015, were announced on the TBW website.